If you’ve been following me for any amount of time, then you’re probably well aware of how much I love Eataly. Not only is it a regular stop of mine here in New York, it’s also at the top of my list of things to-do for visitors (hence why it’s featured in my NYC summer in the city guide) and, obviously, when we were in Torino last year, I couldn't leave without visiting the original Eataly. Suffice it to say, I was pretty excited to hear they were opening a second location in the city (located on the 3rd floor of 4 World Trade Center at 101 Liberty Street). I was even more excited when I was invited to take a sneak peek at it before it opened to the public. And if that wasn’t enough excitement already, I was beyond, BEYOND, beyond excited with everything that the new location has to offer. Basically, my only question is, when can I move in??! 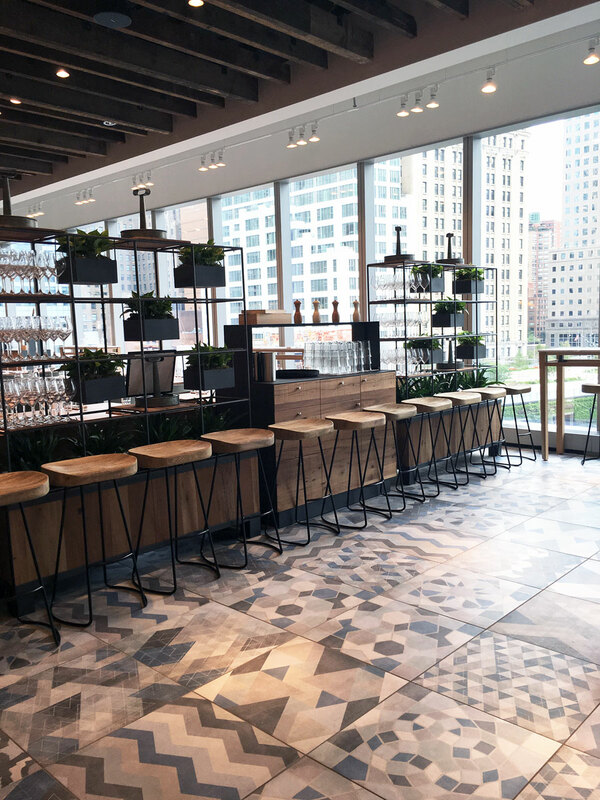 Whether you've been to an Eataly or not, there are so many great reasons to check out the new location …a whole area dedicated just to desserts (Ummm, can I just move in?! ), a smoothie bar, a salad bar, a place to get piadinas (a popular street food in parts of Italy, t's basically grilled flatbread wrapped around things like meat and cheese), a striped shirt that has Ciao Bella printed in little letters on it (You know me and striped shirts...), the freshest of fresh mozzerellas, the most incredible views of downtown and the 9/11 memorial area, beautiful restaurant spaces, seriously talented individuals running each area…….I mean, I literally could go on and on, but I'll save you from reading a never ending love letter to the store by giving you my top 5 reasons to visit the new downtown Eataly. Keep on reading to see what they are, or better yet, check them out for yourself when the store opens next week, August 11th at noon. Breaking Bread || The downtown Eataly store is dedicated to bread and the way in which it brings us all together as it is "the only food created by man that unites virtually every community around the world". While the names and flavors might be different depending on where you are, at the end of the day, bread is, well, bread. It is truly a common language that we can all understand. This Eataly will be “breaking bread” from all over the world by highlighting a different bread every month, inviting in master bakers to bake, test and sell their breads and share stories of how the bread is intertwined into their culture. Wine n’ Shop || As soon as you walk into the store, there’s a little bar where you can either grab a coffee (starting at 7 AM) to go with breakfast (that you can pick up at several options right behind said bar) orrrrrrrr…..wait for it….you can pick up wine! To shop with! I knoooooooowwwwwww. Total game changer! Pasta Pomodoro || But not just any pasta pomodoro. More like the best one of your life (and this comes from an Italian who makes it herself) prepared by Michelin rated Chef Riccardo Orfino at Eataly's upscale Osteria Della Pace. Go there. Order it. Prepare for your life to change. Prosciutto Piaggio Ape || Yes, this really is a little food cart (known as an ape or piaggio ape) with prosciutto on it. No, you aren't dreaming. Yes, this is real life. I honestly have no words, nor are words really necessary. Although I will give you enough words to tell you that you can find this little piece of prosciutto heaven slicing up three types of Italian prosciutto daily in the La Piazza restaurant. Classes for the Masses || In a back corner of the store, overlooking the 9/11 memorial, you’ll find Foodiversità. Simply put, it’s an area where Eataly will be offering free classes, three times a day, to whoever wants them. No signing up, no fees, just walk right up to the table and join in to learn about things like the difference between olive oils, how to roll gnocchi, etc . I mean, could there possibly be anything cooler?